Enabling LED Flash Alerts on iPhone can be really helpful if you are in a noisy place or whenever your iPhone is placed in silent mode. You will find below the steps to turn or enable LED Flash Alerts on iPhone. When you enable LED Flash Alerts on iPhone, you will see a blinking alert of LED light, whenever there is a Call or Message on your iPhone. This ensures that you do not miss important Calls and Messages, when you are in a meeting or in a loud place with a very high noise level (club or movie). One disadvantage of enabling LED Flash Alerts on iPhone is that your device will keep flashing, even if you are getting comments on your social media accounts. Also, LED Flash Alerts on iPhone make use of Camera Flash, which can drain the battery life. Hence, make sure that you disable LED Flash Alerts on iPhone, whenever this feature is not required. 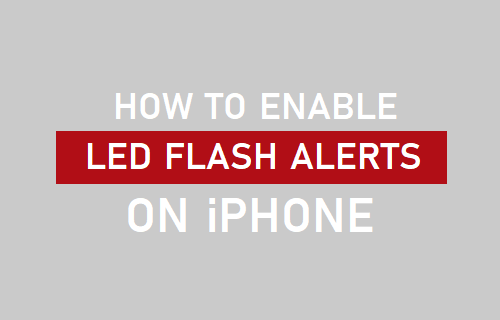 Follow the steps below to Enable LED Flash Alerts on iPhone. 1. Open Settings > tap on General > Accessibility. 2. On the Accessibility screen, scroll down to “Hearing” section and tap on LED Flash for Alerts. 3. On the next screen, toggle on LED Flash for Alerts option. After this setting, you will find your iPhone ringing and also displaying flashing LED light, whenever there is a call on your iPhone. Many a times we put our iPhone in silent mode during important meetings and forget to switch on the ringer, even after the meeting is over. To guard against this common error, you can enable LED Flash Alerts for Silent Mode on iPhone, in order to make sure that you do not miss important calls on your iPhone. 1. Tap on Settings > General > Accessibility. 2. On the Accessibility screen, scroll down and tap on LED Flash for Alerts option. 3. On the next screen, toggle ON both LED Flash for Alerts and Flash on Silent options. This will automatically make your iPhone Flash its LED light, whenever it is placed in silent mode. Note: If your iPhone is paired with Apple Watch, it will not flash or blink, even if you Turn ON LED Flash Alerts on your iPhone.